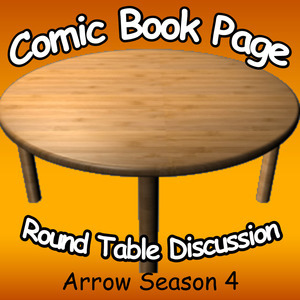 John, of ComicBookPage, and Kay, of PopArtsPlace, have a spoiler filled discussion about the fourth season of Arrowincluding some possible spoilers about Flash, Legends of Tomorrow and Supergirl. If you missed our other podcasts on Arrow, we have posted episodes for Season 1, Season 2, Season 3, Season 4 and Season 5. This entry was posted in Podcast, Podcasts, PopArtsPlace, Review, Television and tagged A.R.G.U.S., Amanda Waller, Amazo, Anatoly Knyazev, Anthony Ivo, ARGUS, Arrow, Atom, Audrey Marie Anderson, Bex Taylor-Klaus, Black Canary, Brandon Routh, Bronze Tiger, Byron Mann, Caitlin Snow, Caity Lotz, Canary, Cedar Cove, Celina Jade, China White, Colin Donnell, Colton Haynes, ComicBookPage, CW, Cynthia Addai-Robinson, Danielle Panabaker, David Nykl, David Ramsay, David Ramsey, DC, DC Entertainment, Deadshoot, Deathstroke, Detective Lance, Dylan Neal, Edward Fyers, Emily Bett Rickards, Felicity Smoak, Flash, Grant Gustin, Huntress, Isabel Rochev, Jamey Sheridan, Jean Loring, Jessica De Gouw, John Barrowman, John Diggle, John Mayo, Katie Cassidy, Katrina Law, Kelly Hu, Laurel Lance, League of Assassins, Lyla MIchaels, Malcolm Merlin, Malcolm Merlyn, Manu Bennett, Michael Jai White, Mockingbird, Moira Queen, Nyssa, Nyssa al Ghul, Oliver Queen, Paul Blackthorne, Podcast, PopArtsPlace, Quentin Lance, Ray Palmer, Robert Queen, Roy Harper, Sara Lance, Season 4, Sebastian Blood, Sebastian Dunn, Seth Gabel, Shado, Sin, Slade Wilson, Starling City, Stephen Amell, Suicide Squad, Summer Glau, Susanna Thompson, Teryl Rothery, The Count, The CW, Thea Queen, Tommy Merlyn, Willa Holland, Yao Fei on October 12, 2017 by Kay. John Mayo, of ComicBookPage, and Kay Kellam, of PopArtsPlace, have a spoiler filled discussion about the third season of Arrow including some possible spoilers about The Flash. This entry was posted in Podcast, Podcasts, PopArtsPlace, Review, Television and tagged A.R.G.U.S., Amanda Waller, Amazo, Anatoly Knyazev, Anthony Ivo, ARGUS, Arrow, Atom, Audrey Marie Anderson, Bex Taylor-Klaus, Black Canary, Brandon Routh, Bronze Tiger, Byron Mann, Caitlin Snow, Caity Lotz, Canary, Cedar Cove, Celina Jade, China White, Colin Donnell, Colton Haynes, ComicBookPage, CW, Cynthia Addai-Robinson, Danielle Panabaker, David Nykl, David Ramsey, DC, DC Entertainment, Deadshoot, Deathstroke, Detective Lance, Dylan Neal, Edward Fyers, Emily Bett Rickards, Felicity Smoak, Flash, Grant Gustin, Huntress, Isabel Rochev, Jamey Sheridan, Jean Loring, Jessica De Gouw, John Barrowman, John Diggle, John Mayo, Katie Cassidy, Katrina Law, Kelly Hu, Laurel Lance, League of Assassins, Lyla MIchaels, Malcolm Merlin, Malcolm Merlyn, Manu Bennett, Michael Jai White, Mockingbird, Moira Queen, Nyssa, Nyssa al Ghul, Oliver Queen, Paul Blackthorne, Podcast, PopArtsPlace, Quentin Lance, Ray Palmer, Robert Queen, Roy Harper, Sara Lance, Sebastian Blood, Sebastian Dunn, Seth Gabel, Shado, Sin, Slade Wilson, Starling City, Stephen Amell, Suicide Squad, Summer Glau, Susanna Thompson, Teryl Rothery, The Count, Thea Queen, Tommy Merlyn, Willa Holland, Yao Fei on October 3, 2017 by Kay. This entry was posted in Podcast, Podcasts, PopArtsPlace, Review, Television and tagged A.R.G.U.S., Amanda Waller, Amazo, Anatoly Knyazev, Anthony Ivo, ARGUS, Arrow, Audrey Marie Anderson, Bex Taylor-Klaus, Black Canary, Bronze Tiger, Byron Mann, Caitlin Snow, Caity Lotz, Canary, Cedar Cove, Celina Jade, China White, Colin Donnell, Colton Haynes, ComicBookPage, CW, Cynthia Addai-Robinson, Danielle Panabaker, David Nykl, David Ramsey, DC, DC Entertainment, Deadshoot, Deathstroke, Detective Lance, Dylan Neal, Edward Fyers, Emily Bett Rickards, Felicity Smoak, Flash, Grant Gustin, Huntress, Isabel Rochev, Jamey Sheridan, Jean Loring, Jessica De Gouw, John Barrowman, John Diggle, John Mayo, Katie Cassidy, Katrina Law, Kelly Hu, Laurel Lance, League of Assassins, Lyla MIchaels, Malcolm Merlin, Malcolm Merlyn, Manu Bennett, Michael Jai White, Mockingbird, Moira Queen, Nyssa, Nyssa al Ghul, Oliver Queen, Paul Blackthorne, Podcast, PopArtsPlace, Quentin Lance, Robert Queen, Roy Harper, Sara Lance, Sebastian Blood, Sebastian Dunn, Seth Gabel, Shado, Sin, Slade Wilson, Starling City, Stephen Amell, Suicide Squad, Summer Glau, Susanna Thompson, Teryl Rothery, The Count, Thea Queen, Tommy Merlyn, Willa Holland, Yao Fei on September 30, 2017 by Kay. John Mayo, of ComicBookPage, and Kay Kellam, of PopArtsPlace, have a spoiler filled discuss about the first season of Arrow. 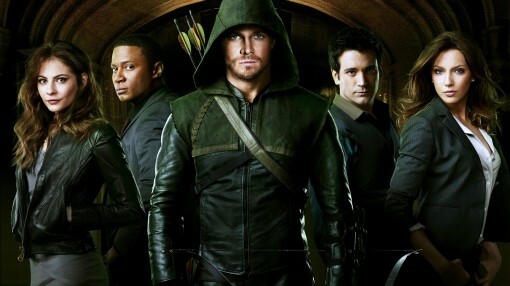 Arrow Comes Alive! – Reimagining an iconic hero from the comic book page to the live-action screen. From the minds of Greg Berlanti, Marc Guggenheim and Andrew Kreisberg comes Arrow, with its solid nod toward the roots of the famous DC Comics character. These two creative forces, along with their stellar cast, will guide this documentary, as they describe their modern update of the Green Arrow for a television audience. Arrow: Fight School/Stunt School (featurette) – From expertly choreographed fights, to stunts that give feature films a run for their money; Arrow takes aim to present the best that television can offer. Experience the extraordinary effort that goes into each stunt sequence. This entry was posted in Podcast, Podcasts, PopArtsPlace, Review, Television and tagged A.R.G.U.S., Amanda Waller, Amazo, Anatoly Knyazev, Anthony Ivo, ARGUS, Arrow, Audrey Marie Anderson, Bex Taylor-Klaus, Black Canary, Bronze Tiger, Byron Mann, Caitlin Snow, Caity Lotz, Canary, Cedar Cove, Celina Jade, China White, Colin Donnell, Colton Haynes, ComicBookPage, CW, Cynthia Addai-Robinson, Danielle Panabaker, David Nykl, David Ramsay, David Ramsey, DC, DC Comics, DC Entertainment, Deadshoot, Deathstroke, Detective Lance, Dylan Neal, Edward Fyers, Emily Bett Rickards, Felicity Smoak, Flash, Grant Gustin, Huntress, Isabel Rochev, Jamey Sheridan, Jean Loring, Jessica De Gouw, John Barrowman, John Diggle, John Mayo, Katie Cassidy, Katrina Law, Kelly Hu, Laurel Lance, League of Assassins, Lyla MIchaels, Malcolm Merlin, Malcolm Merlyn, Manu Bennett, Michael Jai White, Mockingbird, Moira Queen, Nyssa, Nyssa al Ghul, Oliver Queen, Paul Blackthorne, Podcast, PopArtsPlace, Quentin Lance, Robert Queen, Roy Harper, Sara Lance, Sebastian Blood, Sebastian Dunn, Seth Gabel, Shado, Sin, Slade Wilson, Starling City, Stephen Amell, Suicide Squad, Summer Glau, Susanna Thompson, Teryl Rothery, The Count, Thea Queen, Tommy Merlyn, Willa Holland, Yao Fei on September 12, 2017 by Kay.